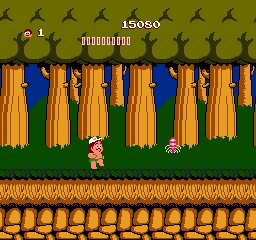 Adventure Island is somewhat of a Mario clone - you guide Master Higgins to the end of every level (8 worlds with 4 levels each, sound familiar?) dodging wildlife, boulders and fire in order to defeat the witch doctor at the end of each world (also familiar?) who has captured your beloved bride-to-be Tina. Things aren't as simple as they are in Mario games though. For one thing, along the way you will find eggs that reveal items when broken. You might find an Axe or Fireballs (the only weapons in the game - you are unarmed when you start or after losing a life, so be sure to rearm yourself); a Fairy that grants you temporary invincibility, allowing you to run through enemies to destroy them; a skateboard that lets you move at increased speed and take another hit (the drawback being that you cannot stop, only slow down); or an eggplant, which will cling onto you for a bit and drain vitality. Adventure Island is known for its difficulty. Master Higgins will die from exhaustion if he does not keep collecting the fruit that hovers in the air in stages, so it is wise to hurry. Making contact with any enemy or obstacle will result in instant death unless you're on a skateboard, so watch out! There is one exception: many small rocks are scattered across the stages. If you trip on one, you will lose a small amount of vitality, but won't die. To make the game a bit easier, there are 4 checkpoints scattered around each stage. Running past these will let you restart there after dying. If you lose all your lives though, it's an instant game over and you have to start back at the very beginning of the game ... unless you find a little secret. Hidden in the first level somewhere is an invisible egg that contains the Hudson bee logo. Collecting this will allow you to continue by pressing a button combination on the game over screen. At the end of each world, you fight the witch doctor. Each time he will change heads and have some more health to take down. For example, he first has the head of a rhino, then a hawk, etc. His attacks do not differ (unlike the various bosses in New Adventure Island, also available on VC), so he basically requires the same strategy each time, similar to Bowser in Super Mario Bros. So, what's up with the similarity to Sega's Wonder Boy (especially the first title in the series)? Well, some key people in the Wonder Boy team left WestOne for Hudson after creating the game. 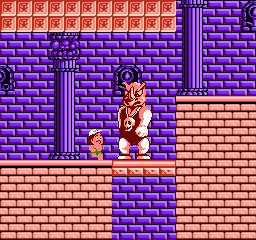 They wanted to port it to the NES, but were obviously unable to use the likeness of Wonder Boy, so they made him resemble Takahashi Meijin, the most famous Hudson employee (because of his button-mashing skills - he can press a button 16 times a second!) 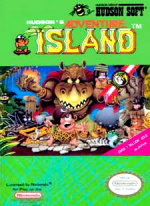 and renamed the game Adventure Island. In Japan, it is known as Master Takahashi's Adventure Island and the main character, while still looking the same as Master Higgins, is actually Meijin himself. After removing some extra levels (Which weren't much different from the rest anyway), ramping up the difficulty a bit and changing the music, it was ready to go! After that, Wonder Boy and Adventure Island went their seperate ways; Wonder Boy became more RPG-esque, while Adventure Island continued with the same style until the final installment, Super Adventure Island II, which combined the Adventure Island style with Wonder Boy's new RPG style, resulting in a fantastic game. 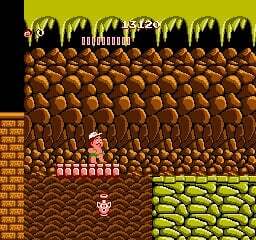 Adventure Island may be the least polished of the series, but it still holds up today. It's never really hard - it just requires quick reaction speed and memorization. If you're a fan of platformers, this is not one to be missed. It's a cult classic and still great. Just get that Hudson bee or you'll be sorry! 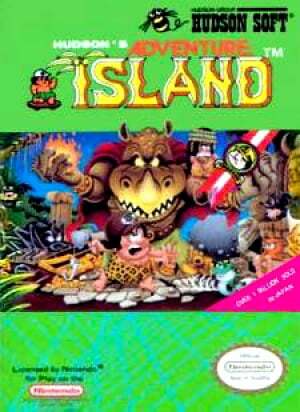 And for those wondering, New Adventure Island is not a remake of this game. It has the same basic gameplay elements, but the levels are entirely different. It also adds two weapons. 7/10. Ristar also recieved 7/10. Clearly, this is not as good as Ristar. Half the score - then it would be accurate. I think this game is far more interesting than Ristar. Of course that's just me.